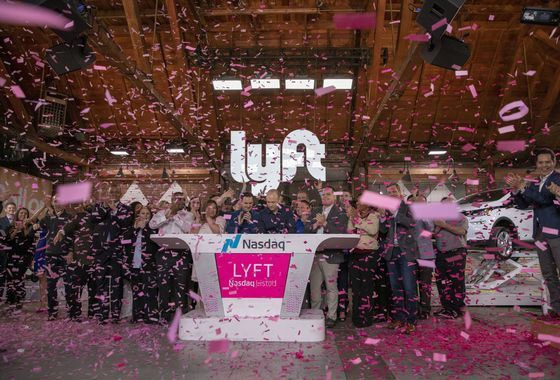 (Bloomberg) -- Lyft Inc. closed its second day of trading 4.2 percent below its $72 public offering price, an ominous sign for the stampede of unicorn companies planning to follow the ride-hailing business to the stock markets this year. On Friday, the shares opened on the Nasdaq Global Select Market at about $87 -- 21 percent above the IPO price. By the close of trading that day, the price was down to $78. On Monday Lyft fell as low as $67.78 before closing trading at $69.01. The Nasdaq closed the day up 1.3 percent. Lyft worked with JPMorgan Chase & Co., which led the offering with Credit Suisse Group AG and Jefferies Financial Group Inc. The San Francisco-based company reserved a pocket of shares, called a greenshoe, for bankers to help stabilize -- and sometimes defend -- the IPO price. 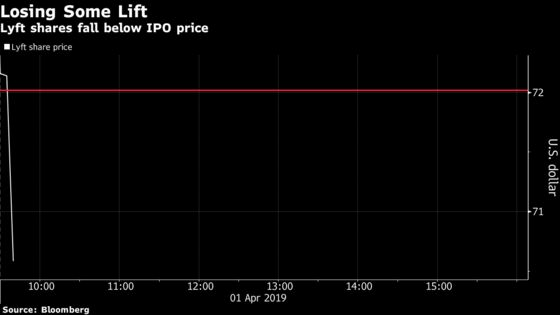 “It’s going to be a struggle today for the underwriters to keep it around the IPO price,” said Erickson, a former co-head of global equity capital markets at Barclays Plc.